The BD & Comics Passion website is online! This new festival, celebrating the graphic novel genre, will take place the 7-9 October, at the Institut français (London). Dave Gibbons (Watchmen), Jean-Claude Mézières (Valérien and Laureline), a cosmic party… and much more ! As webmaster of the Institut français, I worked with the Book Office (organising the festival, in association with Comica Festival) to design and develop the entire website. 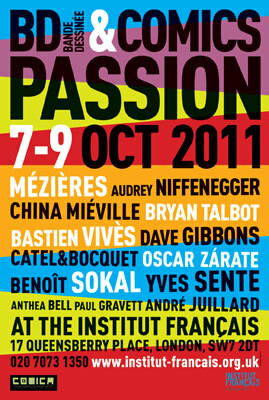 The graphic design is based on the festival poster made by a French graphic designer.